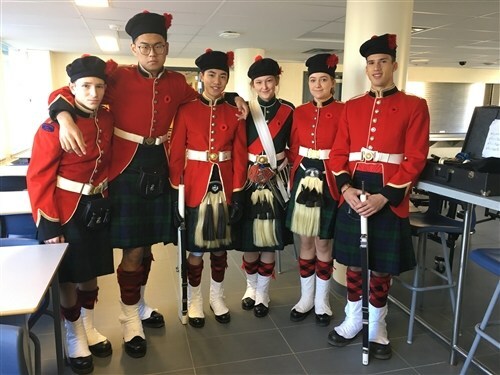 Our 254 Cadet Corps was in full dress mode for Remembrance Day 2017. The Corps was spread out with 12 cadets in Ottawa under the guidance of Mr. Kevin Lakes as part of Operation Veteran. In the Town of Hantsport, a Flag Party commanded by Sergeant Major Charlotte Hache was piped on parade by Master Corporal Grace Gallant. Click here to see the video. The main body of the 254 paraded at the Cenotaph in the Town of Windsor. Though the day had a bit of a cold bite, there was very little effect on the individual cadets. As the Regimental Sergeant Major, Chief Warrant Officer Ella Jollymore gave the word of command – "By the Left – QUICK – MARCH", the Corps moved off and marched down to join the Veterans and the public at the Cenotaph. 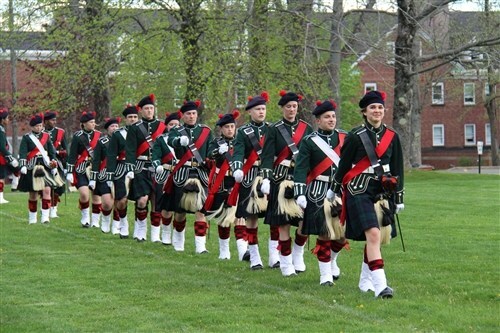 The cadets looked splendid -- some arrayed in traditional Highland dress and the others in Army Cadet Greens. The haunting notes of Last Post and the rousing Reveille were played by the Corps Bugler, Sergeant Ella Brown. The Lament was played by our own Pipe Major, Warrant Officer Nicola du Toit. The Vigil at the Cenotaph was commanded by the Drill Sergeant Major, Master Warrant Officer Meredith Chambers. The official wreath from the Corps was laid by none other than Lachlan Campbell, aspiring cadet and son of KES teacher Mr Rory Campbell and Dr Amy MacDonald. Junior Cadet Campbell was accompanied by Sergeant Major Julia Strickey. The day had finally arrived. The uniforms were crisp and sharp, the pennants were positioned properly, and the flagpoles were sized for height. Best of all, the 254 Drill Team was ready to go. 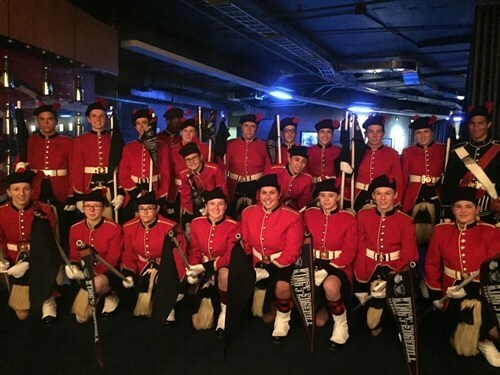 Resplendent in full Highland dress, the cadets of the 254 were piped onto parade at the Bell Centre in Montreal, Quebec. The skirl of the pipes made the blood race through the veins of the audience as they watched the impeccable deportment of these fine young men and women. The pipers fell silent as the Drill Team Commander, Warrant Officer Josh Dupigny, executed flawless drill and positioned himself at the observation point. The quick march of St Catherine's played over the audience and the Drill Team was off. Acting in perfect precision, they executed the movements with dash and skill. The music changed to Road to the Isles, and the team progressed into the Slow March. The dressing was spot on, the bodies were erect with head and eyes straight to the front. Before our team could think about it, the strains of Highland Laddie broke through and the wave of the precision pennant drill commenced.